A world record score on Cinebench 15. Last week, AMD took the wraps off its new generation of processors, which are coming out this Thursday, March 2. We're just a few days away from the launch of AMD's new Ryzen 7 processors, and things are looking good if you're a hardware enthusiast. 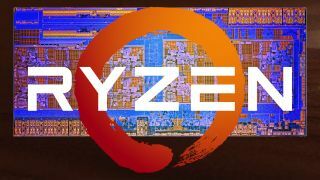 Some people have got their hands on them early, and it appears a team of overclockers has put the flagship Ryzen 7 1800X through its paces. Reportedly, a multi-threaded run of benchmarking tool Cinebench R15 was completed on the Ryzen 7 1800X cooling at 5.2 GHz, achieving a score of 2449, beating the previous world record of 2410. According to TweakTown, a YouTuber uploaded a video, which has since been taken down. Hexus has spotted a Vimeo link which remains active though, and you can see a brief screenshot of the benchmark results, as well as the moment the team breaks the record. The screenshot of the test shows the CPU speed reaching 5201.07 MHz, thanks to a core voltage of 1.875V, the bus speed at 137.78 MHz and the multiplier up at 37.75x. Of course, this was done by professionals, and with the help of some liquid nitrogen cooling taking the temperature down to -200C. There will be three Ryzen 7 models to choose from at launch, with the 1800X being the most powerful, and the most expensive. It has a base / turbo clock speed of 3.6 GHz / 4.0 GHz, and will cost $499. Expensive, but clearly with a lot of overclocking potential on top of the speeds you get out of the box.